← Honda Generators: How Much Power Should I Have? Which Exmark Mower is Best for Me? Are you getting ready to purchase an Exmark lawnmower, but you aren’t sure which one fits your lawn-mowing needs the most? Are you concerned that you’ll make an investment in the wrong lawnmower? Do you simply want more information about the variety of Exmark mowers on the market so that you can better assess which one will fit your yard needs over the long-term? If you find yourself in any of these categories, then you know how important it is to get the right answers about your Exmark lawnmower. Since 1984, Shanks Lawn Equipment has been a leader in lawn and turf equipment for the citizens of the Cumberland Valley. We pride ourselves in customer satisfaction, and for nearly 30 years we have been doing just that! As an authorized full service dealer of Exmark lawnmowers, we understand what kind of equipment is needed to care for your turf. Whether you are in charge of mowing the lawn at a college campus, are involved in commercial landscaping, own a lawn servicing company, or simply have a really big residential home back yard, we can help you to determine which Exmark Lawnmower will best suit your needs. Exmark lawnmowers are an investment, and that’s why it is important to set a budget before you begin shopping. Thankfully, Exmark makes lawnmowers to fit a wide variety of budgets and Exmark offers financing to many Exmark lawnmower owners. When determining which Exmark lawnmower is best for you, consider the following question; why do you need this lawnmower? Jot down the answers to this question, along with details about the turf you are cutting and caring for right now. 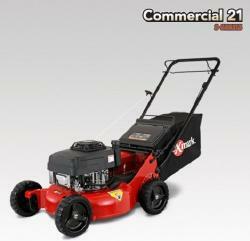 Try to be specific as this information will be important when narrowing down your choice of Exmark Lawnmower. You may find that there are several mowers that fit your needs, and that is where being specific with your needs will help. If you are mowing a small yard at a residential home that is under a half acre, you likely will get along fine with an Exmark 36″ Vantage, an Exmark Commercial 21, an Exmark Viking, an Exmark Metro, or an Exmark Turf Tracer. If you mow a lot of commercial properties that are larger than a half-acre, you might want to consider purchasing a zero-turn Exmark mower, such as the Lazer Z. The Exmark Quest, Navigator, and Pioneer are also excellent choices. If you still aren’t sure about which Exmark is best for you, our website offers a variety of brochures to help you narrow the mower to your needs. Each brochure offers detailed descriptions and specifications so that you can decide which functions and features are essential. Each Exmark lawnmower has unique features and you will find the lawnmower that is best suited to your needs. Purchasing an Exmark lawnmower is a longterm investment in your yard equipment and you will be extremely satisfied with the quality, speed, efficiency, functionality and ease of maintenance of your Exmark lawnmower. For further information about Exmark lawnmowers, equipment or parts, visit our website at www.shankslawn.com or call us at (717) 375-4455. This entry was posted in Uncategorized and tagged Exmark, Lawnmower. Bookmark the permalink.